There are a lot of habit trackers on iOS, but Streaks was one of the first and remains the gold standard against which I measure all other trackers. Even as Crunchy Bagel has added new features and customization options, Streaks’ simple, elegant design has remained at the center of its user experience. That’s important because habit tracking only works if it’s easy to log events. Even the slightest friction makes it too easy to abandon your efforts. I’ve reviewed Streaks 2 and last summer’s major 3.0 update before, so I won’t cover that ground again here. Instead, I’ll focus on what’s new: an all-new iPad app, timed tasks, improved health tasks, and Siri shortcuts. Streaks sits at an interesting crossroads where health and fitness apps meet productivity apps. 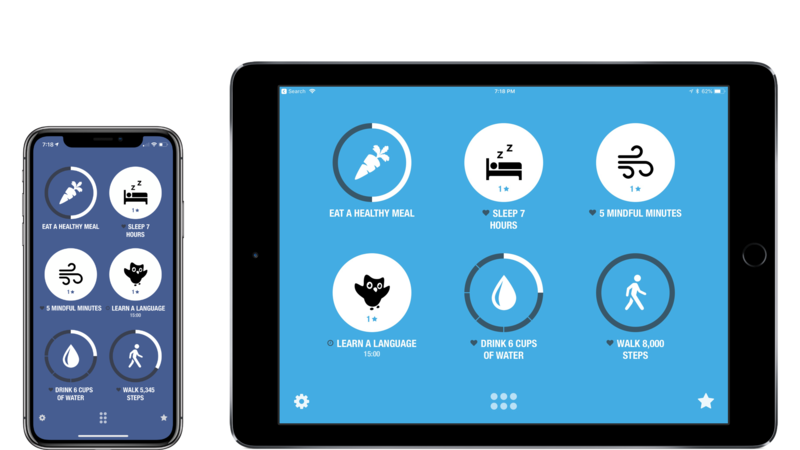 You might use the app to track whether you got eight hours of sleep, how many glasses of water you drank, or how many minutes you spent writing. No matter what habit you want to form, the key is to log it before you forget and move on to another activity. That made Streaks a natural fit for the iPhone and later the Apple Watch, both of which most people have with them all the time. With version 4 though, Crunchy Bagel has added iPad support with iCloud sync. The best part of the new iPad version of Streaks is that it works just like the iPhone. Your habits will show up in the same order in both apps and data syncs seamlessly and quickly. Although I haven’t found myself logging events on my iPad as often as on my iPhone, I’m glad I have the option, especially for tracking activities that I’m more likely to do on iPad like reading. One option I’d like to see added is theme syncing, so the background color of the app is the same on both devices. Those color schemes are a nice way to quickly identify which set of six habits you’re viewing, so having them match across devices, just as the custom icons already sync, would be useful. You can also create a custom timed action or turn existing tasks into timed ones. Once you set the duration of the task you want to complete and the frequency with which you want to complete it, you’re finished. You can set a custom icon if you’d like as well. When you return to the main view, you’ll see your new timed habit with a play icon overlapping the task’s main icon. What differentiates timed tasks from others is that they work as a countdown timer. Instead of tapping and holding to increment the times you completed a task, you tap the timed habit’s play button, and the time starts counting down. Timers can be started from an iOS device, the Apple Watch, or Streaks’ Today widget. As time progresses, the band around the task’s icon fills with each passing minute. There’s no need to keep Streaks open either. When you reach your goal, Steaks notifies you, and the task is marked as completed. Adding timers to Streaks is handy because it eliminates the need to use a second app for a time-based task you want to complete regularly. In my tests, the timers worked well on every device, but opening a timer started on one device didn’t always show that it was running on a second device, and if it did, the remaining time didn’t sync between the two devices. I haven’t found myself frequently switching between devices to check running timers, so this hasn’t been a major issue, but it’s worth keeping in mind. Since the introduction of HealthKit, Streaks has steadily expanded the ways it works with health and fitness data. With version 4.0, the app has added a handful of new and improved tasks that can be tracked. 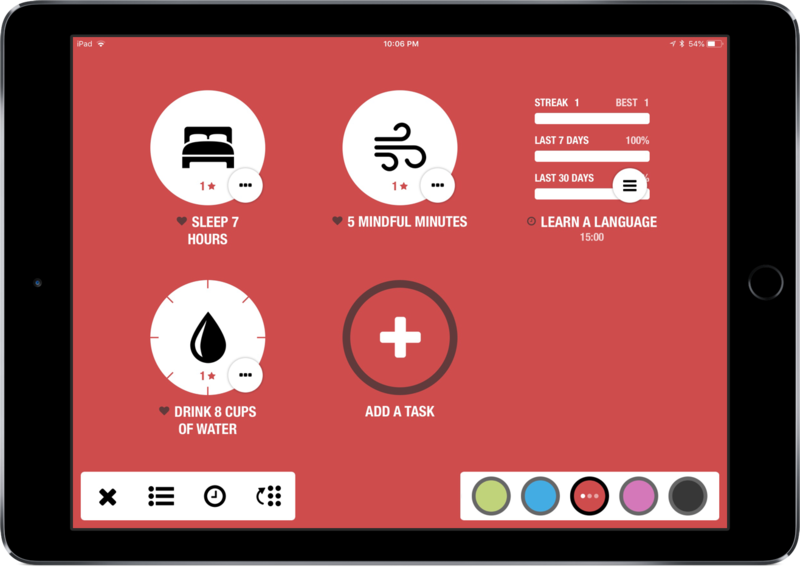 Among the new timed tasks is mindfulness, which syncs with the Health app if the user grants their permission. 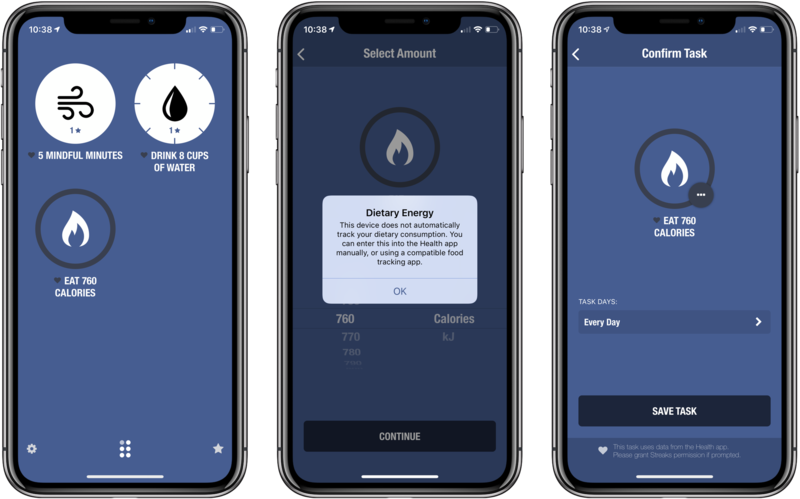 The Water task, which syncs with the Health app too, can be broken into segments now so you can complete portions of the task throughout the day as you drink glasses of water for instance. 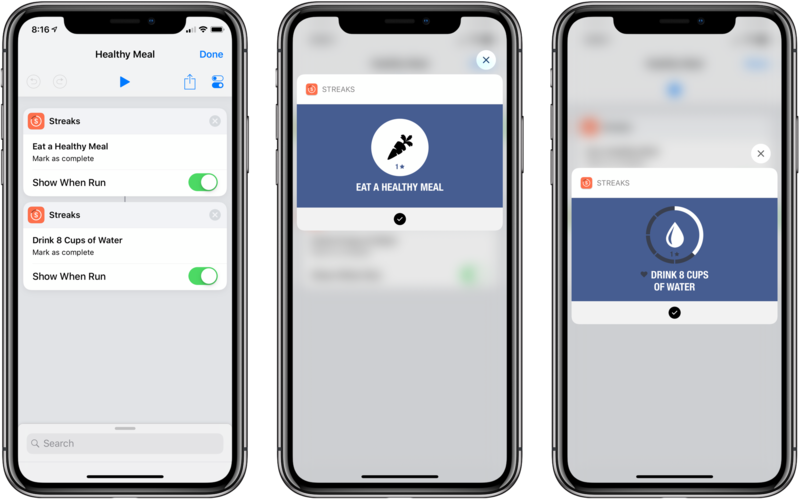 There are new nutrition-based tasks that can track things like caffeine and protein intake or help you eat less sugar if you log them in the Health app or use a third-party nutrition app. You can also set a custom bedtime after midnight if your ‘day’ ends past midnight, like a certain MacStories colleague of mine. Each of the habits you track in Streaks can be assigned a custom phrase to mark an item as completed or remind you to perform the task. To set up a Siri shortcut, tap the gear icon and then the list icon to access Streaks’ settings. Under the ‘Hey Siri’ section of settings, you’ll see a list of the habits you’ve created. Tap on an activity and you’ll find an ‘Add to Siri’ button that lets you record a custom phrase. Of course, the same shortcuts can be integrated into custom shortcuts created in the Shortcuts app too. For example, if you have goals to eat a healthy meal and drink eight glasses of water, and you accomplished both at lunch, you can mark off both goals with a custom shortcut. Just add the Siri shortcuts from Streaks to a single, custom shortcut in the Shortcuts app, then you can trigger it from the app, its widget, or record a custom Siri phrase to mark both goals as completed at the same time. Streaks is a great example of where iOS is heading. Apps are no longer single entities that open when you tap an icon on your iPhone’s screen. Instead, they permeate the device’s system and cross over to other hardware too. 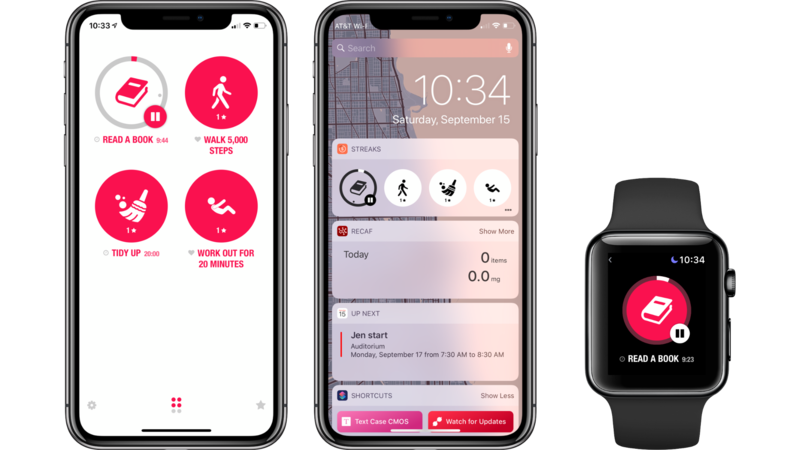 Streaks is an app on the iPhone, iPad, and Watch, but it’s also a widget and a Siri shortcut that can be activated by voice, appear in search results, on your iPhone’s lock screen, or as a suggestion on the Siri watch face. Streaks can’t change the fact that good habits are hard to form, but by making logging so easy, what it doesn’t give you is an excuse to not track your progress. The hard work is on you, but by making logging as accessible as possible, Streaks helps users stay on track by creating a positive feedback loop as they begin to build a streak, see patterns form, and make progress. Streaks is available on the App Store for $4.99.